← Driftwood is at the printer! This past weekend, I took a break to attend a local quilt show in Belvidere, NJ put on by the Evening Star Quilt Guild. The show was not big, but it was very nicely put together. My mother, friend, Linda, and my 6 year old son had a very nice and welcoming time. I went home and realized that I had the makings of a very special addition to the Thanksgiving table! 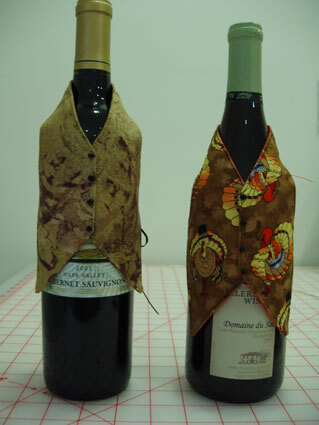 But before I cut into those turkeys, I tried one with some other fabric first. They go together in a snap! 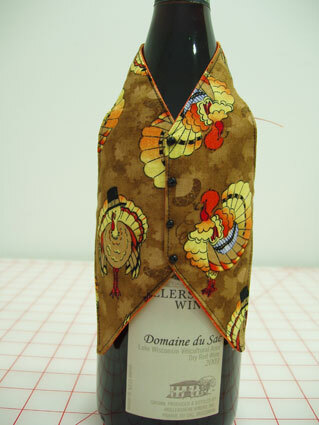 The pattern even comes with enough “button” beads for 2 vests and 1/8″ ribbon for one. I highly recommend visiting their website and ordering the pattern if your local quilt store doesn’t carry it. Perfect for holiday gift giving! My husband said, “Honey, why don’t you just make a bunch so we’re ready for whenever we are giving someone a bottle of wine!” Of course, dear! P.S. Don’t forget to stop by www.HellemayDesigns.com! The pattern for Driftwood is in stock! 1 Response to Cutest little pattern! It is indeed cute, but who needs dressed wine!!? Give me mine nekkid! Hope you guys have a great Halloween!